After best-selling author Dr. Wayne W. Dyer left the physical plane in 2015, psychic medium Karen Noé began receiving very profound and specific messages from him for his family—and for the world. 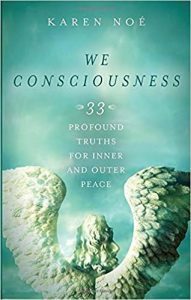 While Wayne comes through to Karen singularly, he also comes through together with a group of other celestial beings called the We Guides, which includes Saint Francis of Assisi and countless other angels and ascended masters.Wayne and the We Guides share 33 concepts that make up the We Consciousness—and they all point toward your becoming an instrument of peace. In order to extend peace outside of yourself, you must first feel peace within yourself. You must expect to see peace everywhere, and acknowledge the infinite peace that you are. Then you must live that identity to the fullest.After understanding and applying these ideas, you will be able to create miracles in your life and the lives of others as well. You’ll learn how to create heaven right here on earth.